Reading and writing go together. Children learn a lot about reading when they understand that spoken words can be written and read by others. Talk about why it is important to communicate a message through written text. Model purposeful writing. Let your child see you writing a shopping list, a letter, an email, a reminder note. 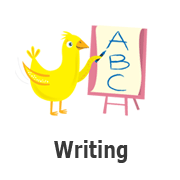 Learning to write letters and words can help your child begin to make the visual discriminations necessary to learn to read. Good readers enjoy using spoken as well as written words to communicate. They enjoy writing their name and making lists using their newfound writing skills. They enjoy writing letters using not only pencils and crayons but also creating them with clay, food, chenille sticks and blocks. Write about going to school. Use photos from magazines or drawings to picture what the first day of kindergarten will be like. Write captions. Have your child "read" the story to you. Write a to-do list to prepare for the first day of kindergarten: buy school supplies, write name on supplies, choose what to eat for breakfast, practice saying your address and phone number. Keep your child busy while you're waiting at a restaurant or in a doctor's office. Pull out some coins. Count them, and sort them by color and size. Play "I Spy" with the coins: "I spy a coin worth 10 cents." Go to a Library Summer Reading program. Have your child draw a picture or a book and then narrate what is happening in the pictures. Ask children to tell you about their drawing and write their words. When your preschooler draws, writes or scribbles discuss what you see and which colors they used. Have your child sign their work or initial like an artist. Get messy while you draw and write. Use shaving cream as a writing wall. Pour the shaving cream on a tray or on the bathroom tiles and have your child write, draw, and scribble on the shaving cream. It’s a great fine motor activity, easy to clean and smells great.